Bottled in the Volcanic Eifel, drunk all around the world: Gerolsteiner is Germany’s most popular and also most exported carbonated mineral water. Bottled in the Volcanic Eifel, consumed worldwide! Gerolsteiner Brunnen was founded in 1888 in the Volcanic Eifel. Gerolsteiner’s unique mineral composition and its subsequent neutral and refreshing taste very quickly made it a popular mineral water – at home and abroad. Within a year, we were exporting our mineral water to the Benelux countries. Gerolsteiner was first shipped to the USA in 1890 and 1895 marked the start of international trade with Australia. Today, more than 125 years after its foundation, Gerolsteiner is just as rooted in its home country and is even more widely enjoyed around the globe. We export to more than 35 countries, including the USA, Canada, Australia, Taiwan and the Benelux countries. Exports account for five percent of total turnover, which corresponds to sales of almost 31 million bottles. Gerolsteiner is not just leader at home, but is in fact the world’s No.1 mineral water brand. Gerolsteiner is sold worldwide, from nearby European countries to South East Asia. Click on the map to find out exactly where. Gerolsteiner partners with national distributors in the individual countries, who are responsible for selling the products in selected supermarkets, speciality outlets, and catering businesses. International trade focuses on Gerolsteiner Sparkling Mineral Water, which is available in both the optimized high-quality glass bottles, as well as in the light PET bottle. The sizes vary between 0.33 l and 0.75 l for glass and 0.5 l, 1.0 l and 1.5 l for PET. Gerolsteiner Naturell and Apple Spritzer are also available in selected countries. These products are also available in the glass or PET bottle in different sizes. Due to the proximity, the range of products available in the Benelux countries is broader. 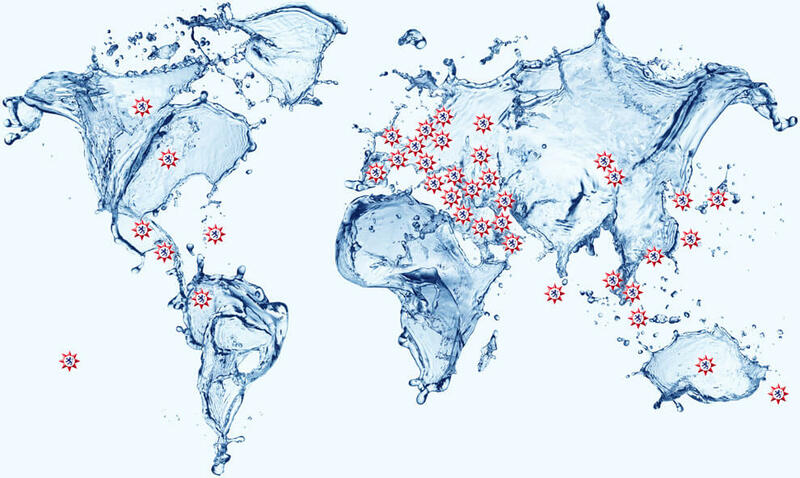 All mineral waters are not created equally – each has an individual mineral profile based on their origin. To help you understand these differences and make informed comparisons, Gerolsteiner has developed an international version of our popular Mineral Calculator, which compares our mineral water with waters from other countries. You can access this Mineral Calculator in two ways: directly online at www.mineral-calculator.com or with the “Mineral Waters” app for iPhones, available for free from the Apple App Store.